I haven’t seen much online in the way of reviews regarding the new Tamiya TT-02B Neo Scorcher 4WD buggy so I thought I’d drop a few comments and pictures here. Hopefully this will help other n00b’s out there as I’m very happy with the Neo Scorcher so far as an entry level basher buggy. 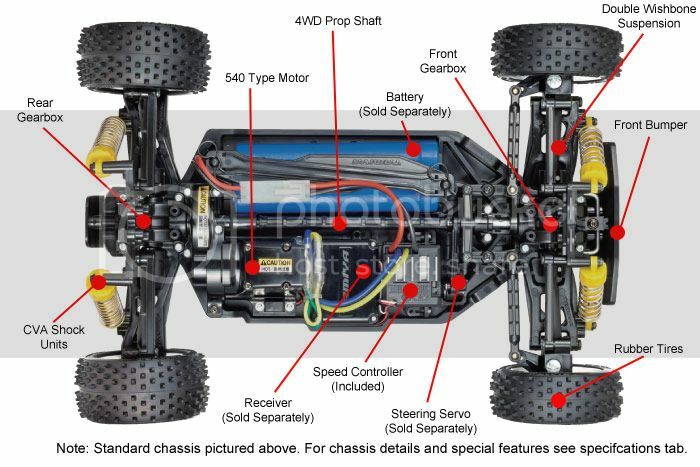 Please keep in mind i’m still pretty much a n00b and don’t have much experience with other RC cars and other types of buggies, so I don’t really have much to compare it to when making comments - I welcome your comments and opinions! First of, why did I choose the TT-02B Neo Scorcher buggy? * I love taking an entry level model and hopping it up – Yes it’s a waste of money (I should just pay more initially and get a better model), but I love tinkering with it and getting the best performance out of it. That for me is half the fun! As I mentioned above, I actually have two Neo Scorchers – One for the kids and one for me to do up. I’ve already completed the kids one and have kept it pretty much stock apart from a Tamiya high torque servo saver and drivetrain + wheel bearings. It’s running the stock ‘Torque Tuned’ motor, a HPI SC-15WP ESC, HPI SF 10W servo (more on these later) and Tamiya Finespec radio gear. I’ll probably switch it back to the standard Tamiya TEU-105BK ESC soon as I want to take advantage of the Tamiya training mode (reduced motor power output) while the kids are still learning. Was simple and fun to build and have had a lot of fun bashin it around with the kids. Despite a few heavy hits we’re yet to break anything (knock on wood!). Next up I chose to build mine with a number of initial hopups / upgrades, after all I have the kids one to serve as a base reference. Stage 2 will include suspension upgrades – More to follow later once I have the funds! Ok so lets get building. Having already built a sedan version of the TT-02 the first steps building the drivetrain and diffs are identical. In fact I’ve heard all the diffs from TT-01’s also fit - I’m running a TT-01 1.5 CS gear set in my TT-02 drifter currently. I’ve chosen an Eagle Racing front one way as I’ve found it improves the steering and reduces understeer. Plus, when used correctly, you can get a similar effect to hand brake turns as only the rear locks up under brakes. 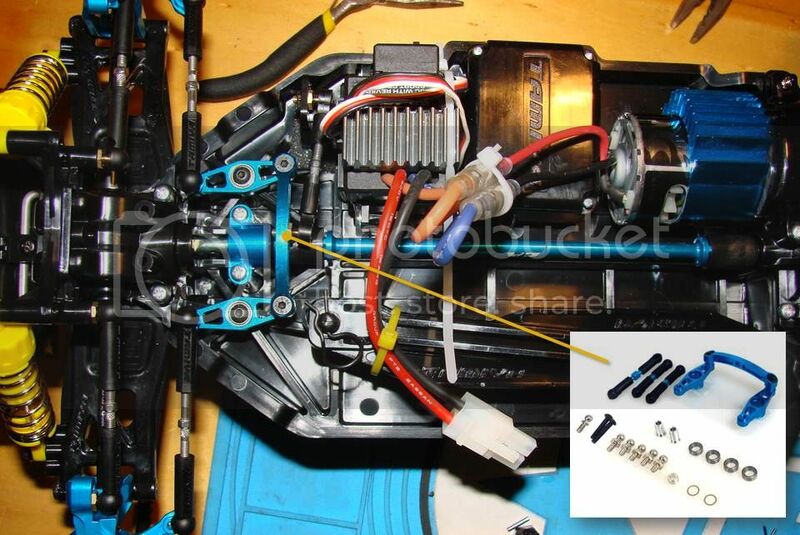 Note that this particular one uses the smaller outdrives / drive cups so you can’t use these with the stock dogbones or any uni’s with the large head. I’m also testing an Eagle Racing locked rear diff / solid rear axle as I like it to have a lively rear that likes to step out. I chose the type that fits into the original diff casing so I can use the stock outdrives and dogbones, again to make the rear more lively compared to the front. Be careful driving with a locked rear diff on-road – It can no longer spin the inside and outside wheels at different rates while cornering which will eat up your tyres or stress the drivetrain. I’ve also packed a standard open gear set with anti-wear grease to hopefully act like a LSD, which I plan to swap in an out and see which works best in each situation. The main drive shaft is an Eagle version to better handle increased power output. I’m using the Tamiya alloy one in my drifter but haven’t been as happy with it as its basically a big dogbone and still has some rattles. The Eagle one in comparison is moulded to the same shape as the stock version and fits snuggly. There’s also an Eagle bearing cover over some of the non-stock drivetrain bearings to reduce heat build-up from the faster motor. 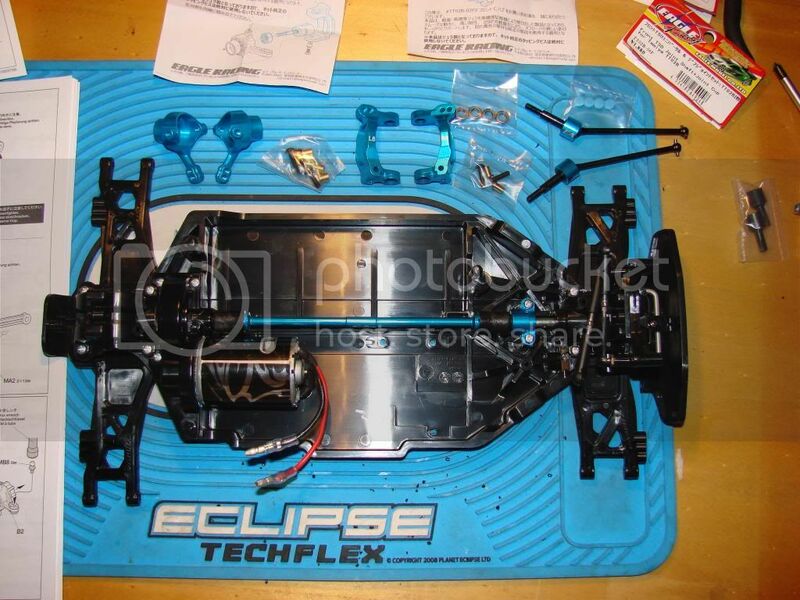 The next few pics show the lower suspension arms, HPI Firebolt motor (alloy motor mount not seen) and the Eagle front knuckles, C hubs and universals. 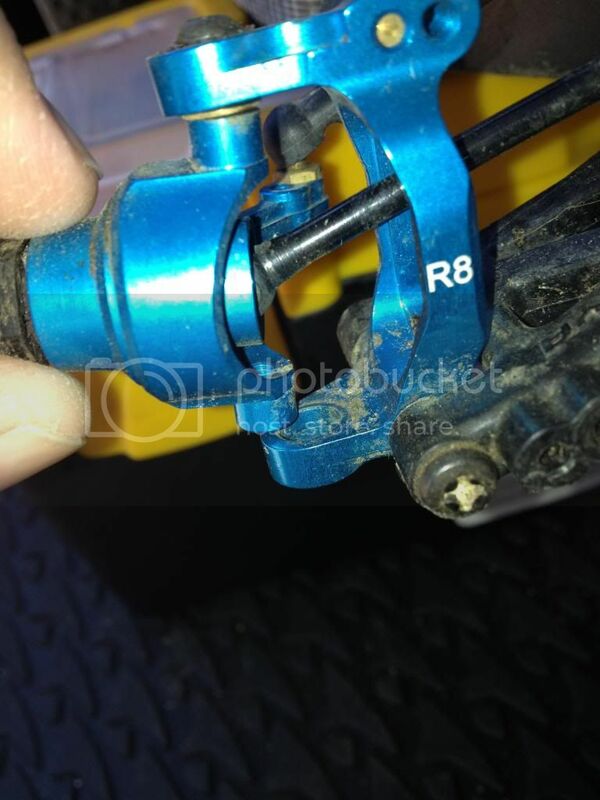 Note even the C hubs feature bearings! I actually installed the sleeve opposite to the instructions which I found allowed much more freedom of movement. My idea here is to make the front end as smooth and refined as possible, so it handles well up front, but then with a lively rear end that likes to break away. The alloy knuckles in particular (when combined with radio gear that allows you to fine tune the end points) allow for significantly increased steering angle vs stock. Have to be careful not to go too far though or else the uni’s start to chatter the front end. Next with the stock suspension installed – This should hopefully be the next area to receive upgrades. 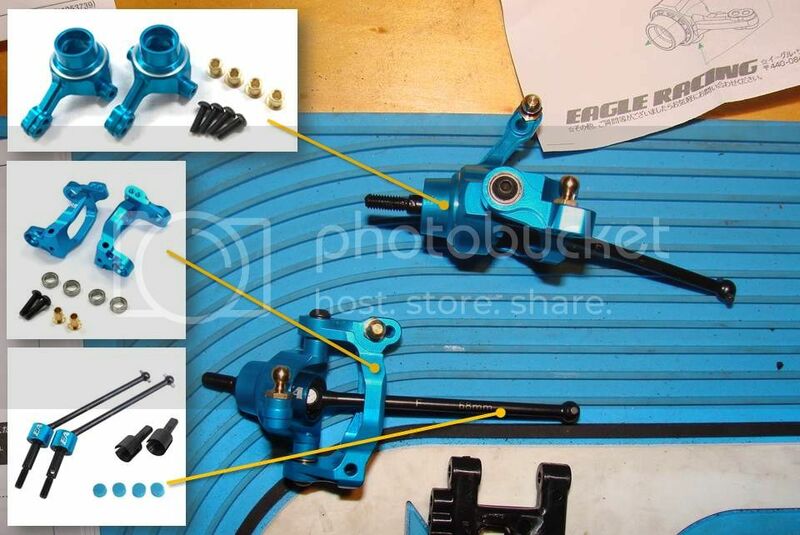 And also the Eagle alloy steering system with bearings. From my experience with TT-01’s this radically improves the steering. 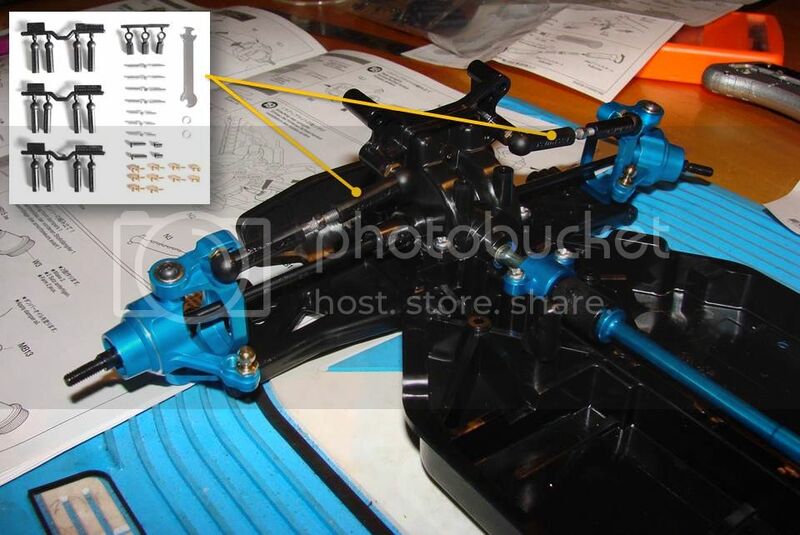 Apart from the connection between the steering arms and front knuckles, the steering system is the same as the TT-02 sedan models. 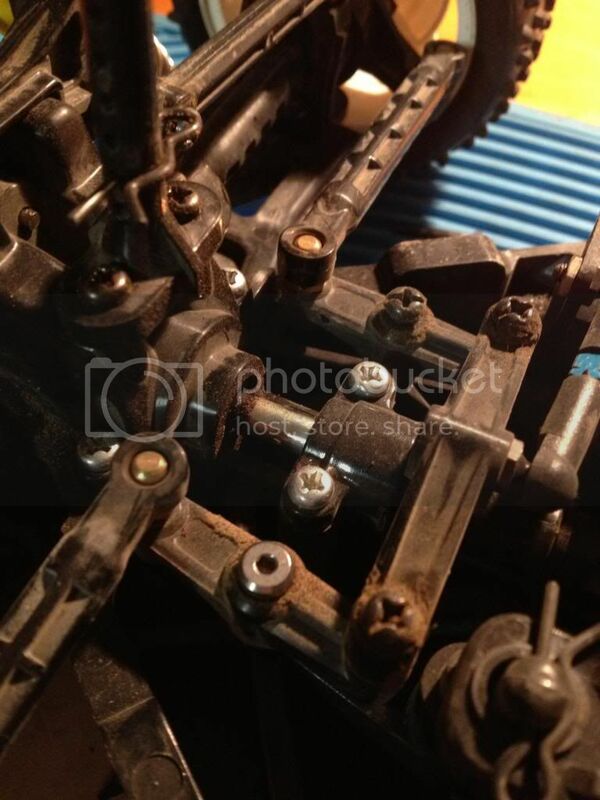 The Tamiya turnbuckles were a good kit with specific measurements to allow easy dial-in. More pics to follow soon of the finished body and drive reviews. Have uploaded pics to an album, but don't have enough posts to link them. Please feel free to visit my profile to view. You need something like 15 or 20 posts to enable the links for adding pictures. That being said, your writings above could have been made into the needed 15 posts since it was such a long writing. Just a thought. I applaud you for typing that all up! Original post now updated with pics - Cheers. Hi. 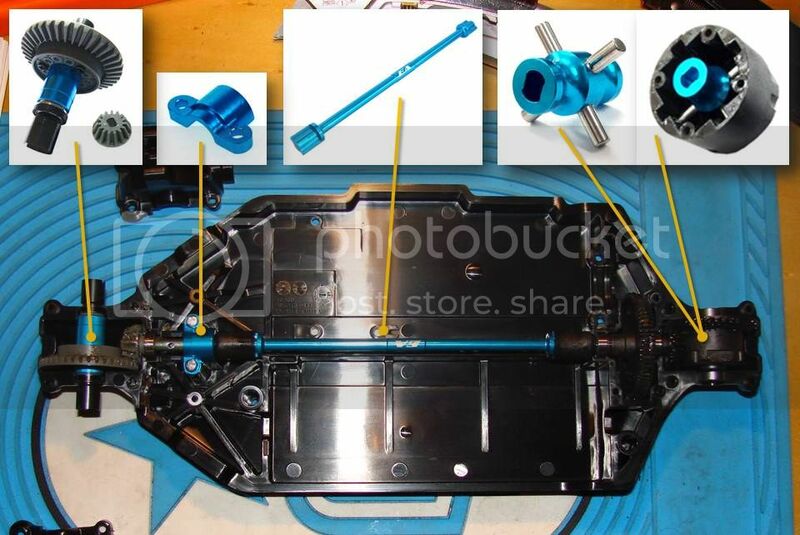 I was wondering if you could post the part numbers for the Eagle Racing parts. I bought this as my first Off Road rc buggy and I have gotta say it has held up very well to my noobi bashing at my local track. 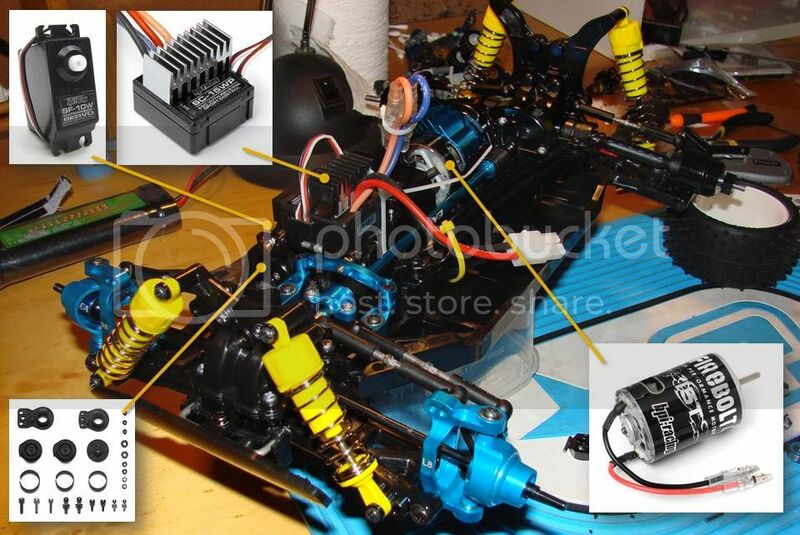 I am running it completely stock except for ball bearings and a 6000kv 4.5T brushless motor, 60A esc. The only thing that has broken on it is the small bevel gear at the rear which transfers the driveshaft power to the differential gear, it just stripped out the inside so that the driveshaft would slip inside the bevel gear so it was effectively front wheel drive. ANYway is was wondering where I can get an aftermarket one which is metal if anyone could help me with that then that would be awesome. Rcmart does have the stock G-parts bag for like $4.50 so its no biggy for spares, I just wanted to make mine a bit more bulletproof. Does anyone know if the 02r and 02b handle much differently on an off road track? Im still new to this hobby so I'm slowly learning. Im thinking of converting mine to the buggy but im guessing the main changes I'd think without going overboard with changes could possibly be the front bumper, shock towers (which would suit the body of the buggy too) and bigger springs (currently using a 55mm damper set from YR) to accommodate? Would also like to put the neo body on as well but hopefully later Tamiya will release some newer bodies. Last edited by Djchow85; 03-09-2014 at 04:17 PM. @ Sashamay - Part numbers updated into original post, sorry for the delay. Just head to www.broadtech.hk/eagleshop and search TT02 (and TT-02) for more. @ DJchow - Not having tested it (the next project is a TT02 rally!) I would say the buggy would have to be much more capable off road (less body roll, more grip, etc) due to its wider track, bigger suspension and chunkier wheels. I've looked at doing a similar conversion (I'll look into the parts you'd need and edit later) but you might find that it would be better just to buy the neo scorcher kit. Once you've paid for all the other bits it might be pretty close plus you'll have additional spares. The other reason to consider it is I'd be worried about re-screwing the central parts too often. In my limited experience, the screw holes are easily damaged resulting in loose screws. You could instead just switch the electronics over as needed. 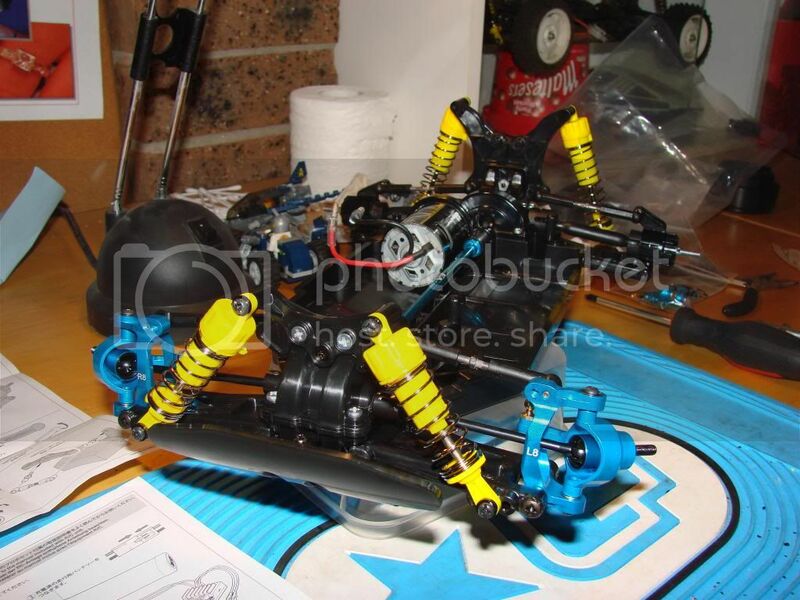 EDIT: @ DJchow - After a quick look at the manual, you'll need the parts trees for A, B, C, N, V, X, W, Y and at least metal part bags A, B and a couple of items from C... Plus body and a set of wheels and tyres. You might be able reduce your need by ordering a shock set, needed screws, etc elsewhere but I think you'd be better off just getting the kit. Cheers. thanks for checking it out for me. Yeah I think i'll just try get the most out of the TT02r.. nothing has been broken yet except a slightly bent body mount. Not bad since my car has done quite a few cartwheels on an off road track! Sorry DJ, I've got next to no experience with the different oil weights and the differences they have on driving characteristics! How is this going? Will it be a pure basher or you'll be racing? Thanks for your interest DJ. Currently I'm still driving both and experimenting with upgrades. Mainly just bashing. So far the stock version has proven to be pretty bullet-proof even with some pretty serious bashing. I'll be posting some drive reviews soon. Sorry for the lack of feedback to date but it’s now been some months driving both the mostly-stock and the hopped-up version of the Neo Scorcher, plus I’ve tested some upgrades, so I’m well overdue for a bit of an update. Again bear in mind that I haven’t driven all that many buggies before so i’m pretty limited in what I can compare it to. I had a 2WD buggy just prior to these - a brushed Haiboxing (HBX) Quakewave (which I think was a very good copy of some of the higher end 2WD buggies) which had the motor mounted over / behind the rear wheels / axle and had a slipper clutch. I was very happy with it but sold it as at the time I didn’t really have a place to drive it. Compared to that the TT-02B Neo Scorcher has very different balance and handling. The balance I find is much more neutral, I think due to the motor/weight being mounted within the wheels / chassis, not hanging over the back wheels. The Neo Scorcher drives very flat through corners with very little body roll, and when jumping (small jumps) invariably stays quite flat in the air (regardless of throttle) whereas I found the Quakewave to be pretty all over the place wanting to flip out when jumping. In terms of steering, with a bit of toe-out the Quakewave loved to drift around corners with minimal power whereas the 4WD of the Neo Scorcher continues to pull the front through the corners, and will only step the rear out under hard power / very loose surfaces. I was however driving on different surfaces with different tyres so take the above with a grain of salt. When jumping and one of the front wheels lands first it will noticeably pull from that wheel making it very easy to control. Personally I would recommend a 4WD buggy to anyone just getting started – easier to control than a rear wheel drive. Cornering in the stock version is ok – It can take about as much steering angle as the servo can turn (note i’m running standard Tamiya 2.4ghz Finespec on the stock version so can’t adjust EPA) but is somewhat limited due to the large dogbones and chunky knuckles. The stock plastic parts and steering arms give it a little toe-out at the front and noticable toe-in at the rear. 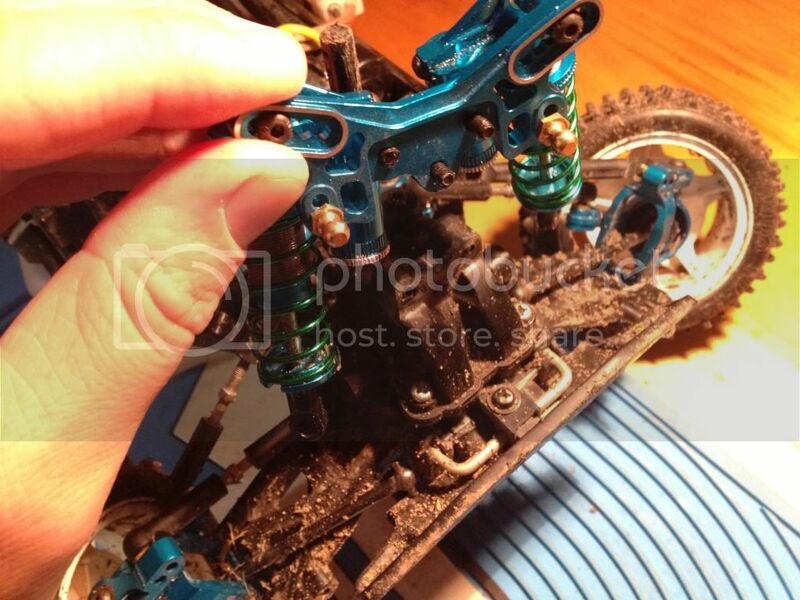 I have moved to the upgraded low-friction screws (Tamiya part no 54550) for the steering posts on the mostly stock buggy, as I hoped they would improve the steering response plus they have the tighter screw thread – I found the stock tapping screws started to come loose. Pic shows one of each type in place. With the front end / steering upgrades on the hopped up version I can achieve a lot more steering angle both due to the reduced bulk (dogbones, knuckles) and EPA adjustments, but at the risk of introducing some chatter into the front end. The steering improvement is noticeable, particularly given the front one-way upgrade, with much tighter turns. However the Eagle front one way was the first thing to go on the hopped up version, or more correctly the bevel gear which stripped teeth (using a 15T brushed motor). Note that this was the bevel gear supplied with the Eagle one way, not the kit-supplied bevel gear. I ended up going back to a regular open diff packed with anti-wear grease to help reduce its differential movement. At this point I should note (given it’s the subject of much discussion) that although I hear the gears skip frequently, I have not noticed any wear on the ‘plastic’ gears – Either the outer or internal diff gears. I know a lot of people were worried they would given they are plastic not metal. I’m pretty sure you could get metal ones from one of the DF or DT models although they are getting harder to find as they get older. 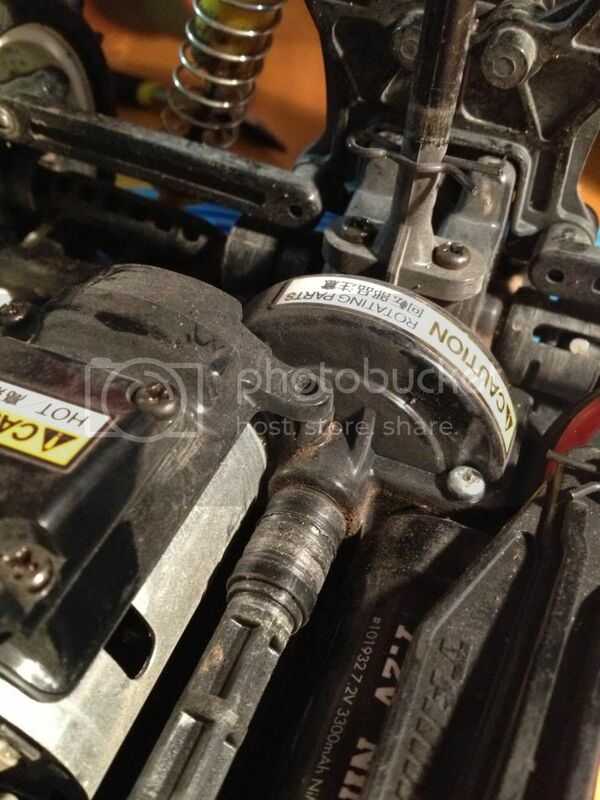 Note though that I’m not running powerful brushless motors and some of my rear diffs are locked. In terms of speed the stock Tamiya Torque Tuned 540 motor / 17T pinion is quite nippy for initial acceleration but lacks top-end speed. Not that the top end speed is slow, but neither is it fast. I think this is fine for acceleration / a basher / kids buggy ‘ driving round the front yard as more top end speed just equals bigger crashes and more repairs! Also given the type of driving you do with buggies, initial acceleration is what you need most of the time. It’s enough power to spin the wheels (well ‘wheel’ more often than not given the open diff) moderately on loose surfaces. The 15 turn brushed HPI Firebolt 540 motor upgrade (still with the 17T pinion gear) gave a nice boost of all-round power. Nothing staggering, maybe a 15-20% increase over the stock setup and I don’t think you’d need anything faster for a street basher. However on a 1/10 off-road track it feels slow, especially down the main straight, and will not clear a double jump (tyres may come into it too). 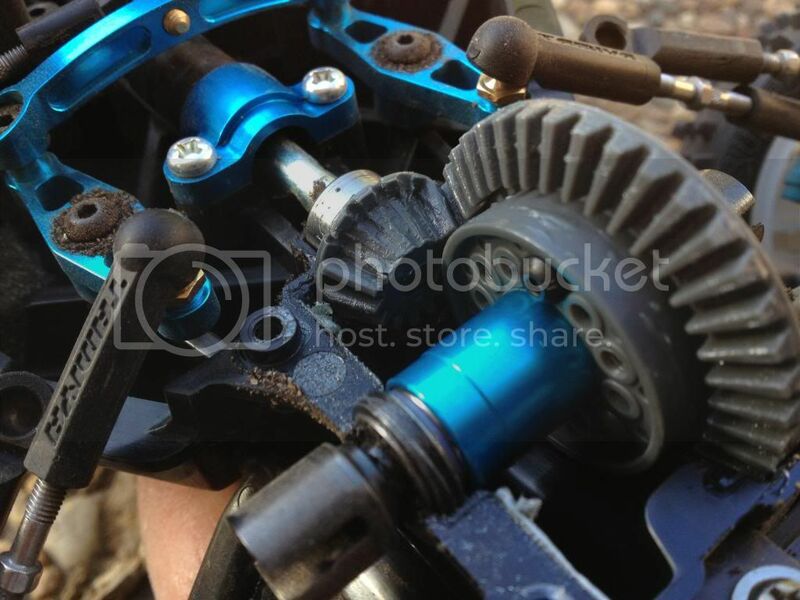 I think I may have hurt the motor running it continually at full power on this gearing. A few cooling fins snapped off through the exposed holes in the motor too. I tried a bigger 19T pinion (Tamiya part number 50355) and it made a world of difference and I highly recommend that if you go up in power the go up in pinion size. The manual recommends no higher than 19T with the kit included 70T spur, however some sedan versions come with a 22T pinion on the same spur and the manual says you can go up to 25T so…? Someone else will have to weigh in on that. Note the supplied 17T pinion is steel I think whereas the 19T on there now is alloy. 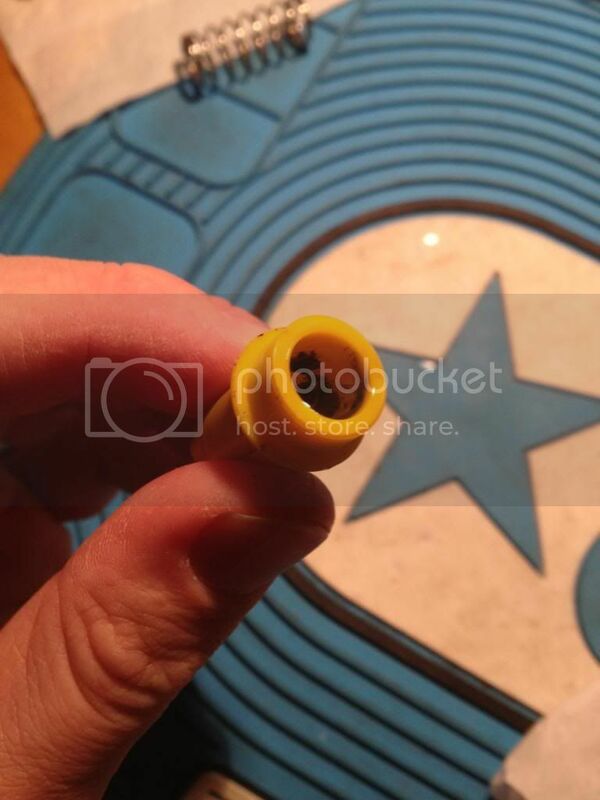 Does anyone know where you can get metal pinions that match Tamiya pitch? This is probably the area I’m most frustrated by – The ride height for the Neo Scorcher is quite low which is fine for just bashing around and it handles well, but take any sort of jump and it will bottom out hard all the time. I don’t understand why you would give a buggy such long shocks when there is so little ground clearance – It bottoms out well before the shocks reach their full travel. 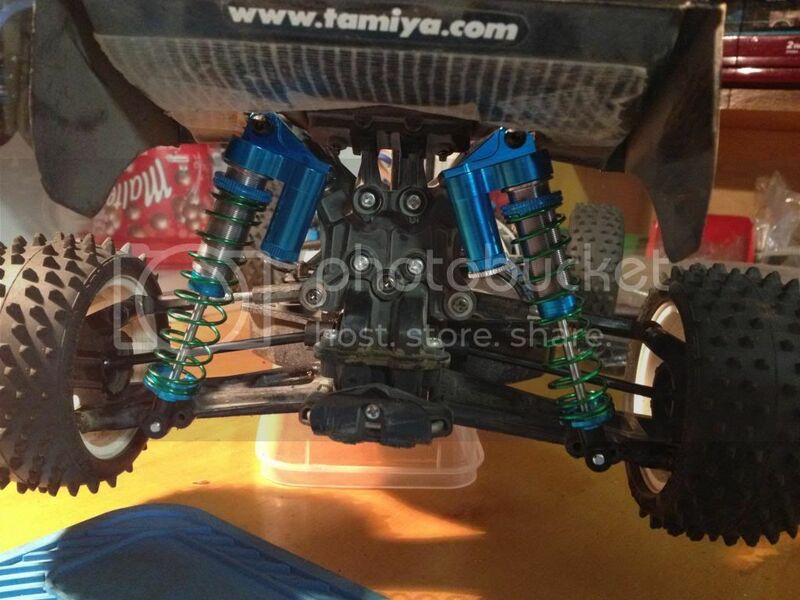 It’s also difficult to increase the ride height with the stock shock mounting positions. I tried putting some very fancy Eagle piggyback shocks on but ended up going back to the stock ones as they added weight and were difficult for a n00b like me to tune. 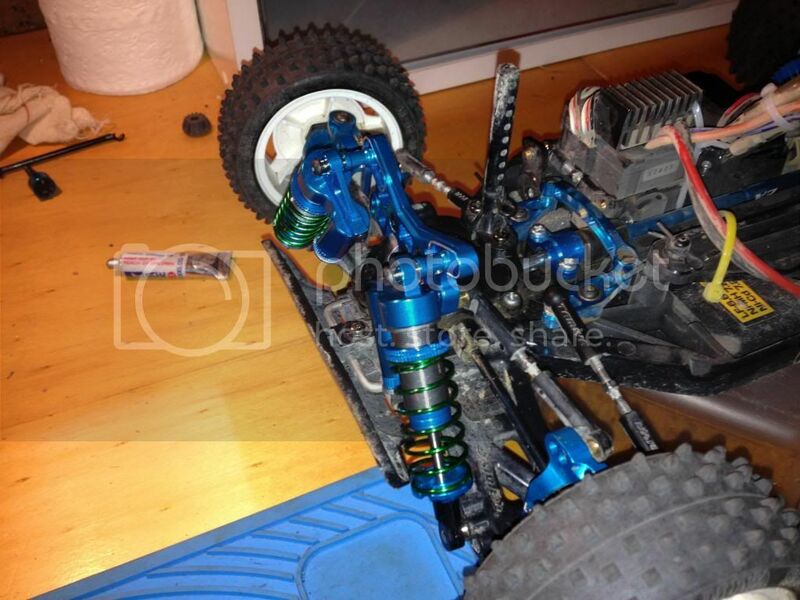 Note that many Tamiya buggies use the same shocks – DT-03, DT-02, DF-02 – so you can use shock parts from many other buggies to tune. At present I’m fiddling around with oil weights, pre-load clips and springs but any advice in this area would be appreciated. 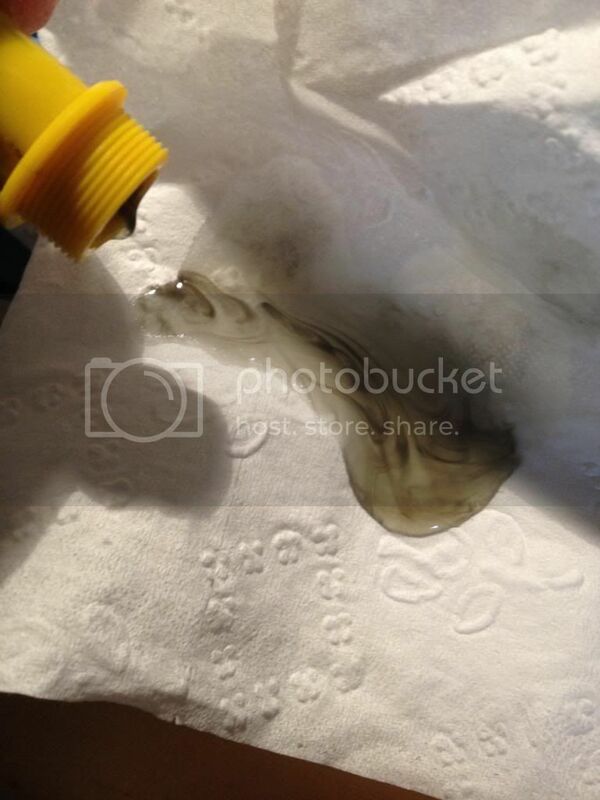 I’ve also experienced some discolouration of the stock shock fluid too – I’m not sure if it was rust or something??? The supplied tyres are very good for bashing through a variety of loose surfaces. I think their only weak point is on hard packed clay / dirt surfaces like those found at off-road tracks where I don’t think they give you enough grip. 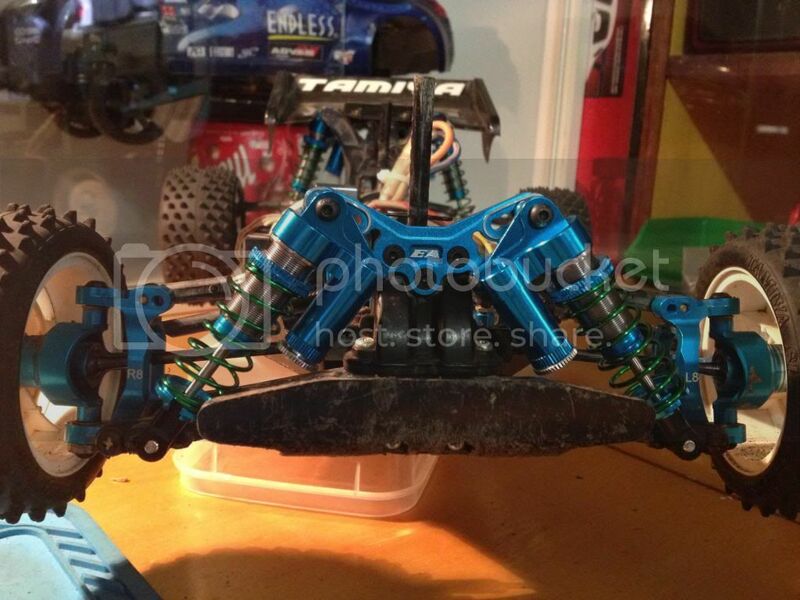 There are Tamiya upgrades which I plan to try soon. Also note if you run the stock tyres on regular road tarmac they will wear down quite quickly. On the mostly stock version I’ve had one of the step screws that holds the shock absorber get torn out, I think by a large rock (almost lost a dogbone too). 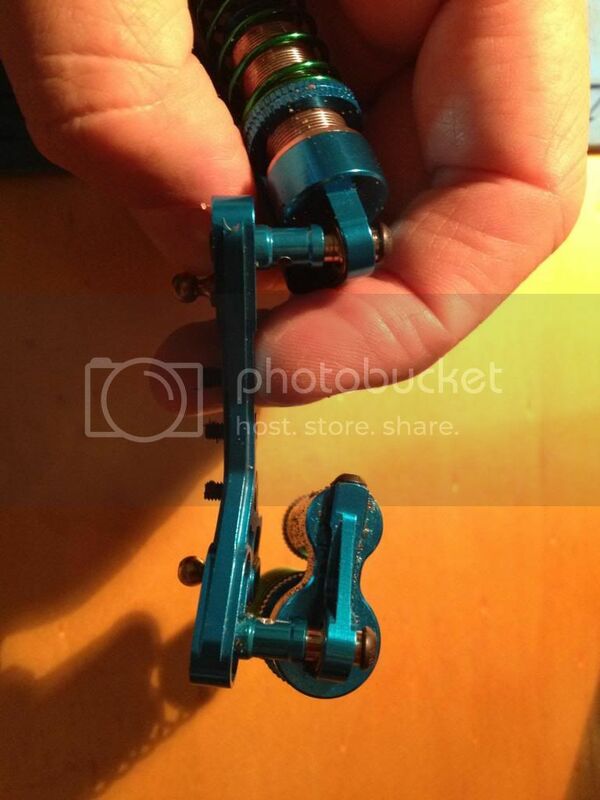 Ball joints or the tighter non-tapping screws may be the way to go. One of the screw-points for the motor / spur cover also cracked (see centre of pic) although I may have over-tightened it. I also recently hit a fence and broke one of the low-friction steering post screws, leaving the bottom half embedded in the tub which will likely mean a new tub - cheap enough but time-consuming having to transfer everything over. On the hopped up version i’ve snapped a front Eagle uni on a particularly bad cartwheel. I also hit the screws out of the front upper suspension holder (using an upgraded alloy piece, replacing the stock A5 piece) but it did go head first into the back of a 1:1 car tyre which focussed all of the impact at that point. On a 1/10 track I nose-dived it a hundred times trying to clear a double and it didn’t quit on me once so pretty happy with the toughness – Perhaps just use longer screws than stock. Big shout out to Banzai Hobby who especially got into stock the Tamiya part to repair this. Their service is really top notch even for small-timers needing a hard to find part. 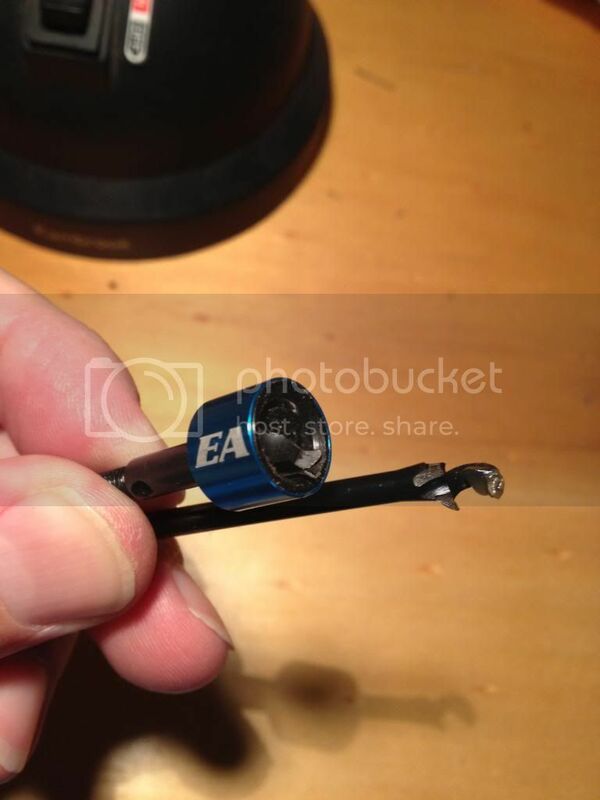 I’ve also broken one of the Eagle front C cups – Not sure if a screw came loose or something. All up though the buggies have been put through a lot, both by me and the kids, and have stood up fairly well. The main problems I’ve had have been with the upgraded pieces so I have no problem in recommending the Neo Scorcher as a great basher car. I’ll keep updating when I can but please feel free to comment and make suggestions! All times are GMT -7. It is currently 12:00 PM.